I know that the concept of sweet potato ice cream sounds kind of weird, but trust me - this is good stuff. I absolutely love sweet potatoes, and while I typically eat them in more savory fashions, I am also a fan of sweet potato pie. Which is basically what this ice cream tastes like. Fresh sweet potatoes, pureed with milk, brown sugar, cinnamon, a pinch of nutmeg, and I added a little bourbon to the mix - as far as I'm concerned very few things are made worse by the addition of bourbon. I think this ice cream would make a great addition to a Thanksgiving dessert buffet: Serve a scoop with sweet potato pie for a double whammy, or on top of a cinnamon cake for something a little out of the norm. You could even use it to make an ice cream cake if you're feeling really adventurous. The original recipe calls for maple-glazed pecans to be mixed into the ice cream during the churning step, but I had other plans for this that required a smooth ice cream. And what I did - well I'm sharing it tomorrow, but rest assured it was something evil and genius. I'll give you a hint: toasted marshmallow was involved. Cut the sweet potatoes into 1-inch cubes. Place in a medium saucepan and cover with water. Bring to a boil, reduce heat, and simmer about 20 minutes, or until tender when poked with a sharp knife. Drain the sweet potatoes and cool to room temperature. In a blender, add the cooled potatoes, milk, brown sugar, cinnamon, nutmeg, vanilla, bourbon, and salt. Puree until very smooth, at least 30 seconds. Press the mixture through a fine-mesh strainer into a medium bowl, cover with plastic wrap, and chill for several hours in the refrigerator. Freeze the mixture in your ice cream maker according to the manufacturer's instructions. Transfer to a container and freeze for several hours before serving. This sounds delicious Jojo! Love the whip cream on top! this ice cream looks amazing! 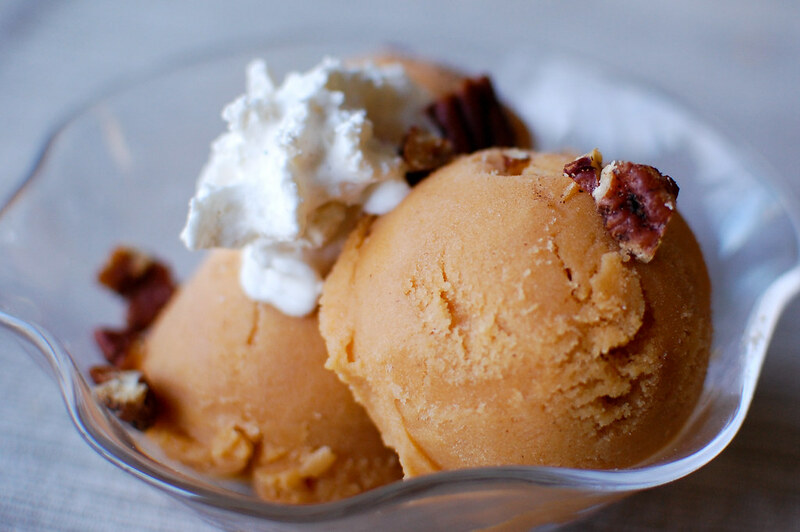 sweet potato is one of my favorite foods, so i'm sure i would LOVE this ice cream. can't wait to see what you did with it! they can, how much can. I will-power be very thankful to You.